This week Altman Weil released its 2014 Chief Legal Officer Survey. It confirms the buying power of general counsels remains strong. The survey presents a range of interesting results. I call your attention to two findings that explain the price pressure that Big Law face. 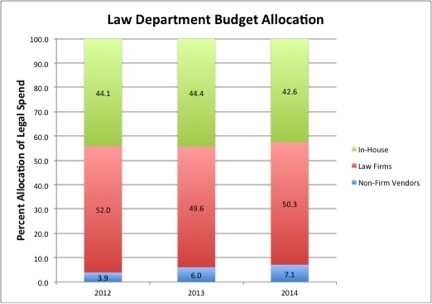 The shifts do not look dramatic when displayed in the 100% bar view but note that law firms have lost two percentage point share of spend in two years. And non-law firm alternatives, which includes e-Discovery, document review, due diligence, and legal research, has almost doubled its share in two years. We have Economics 101 here: buyers (CLOs) shift their dollars to in-house work and alternatives while suppliers (law firms) increase capacity. 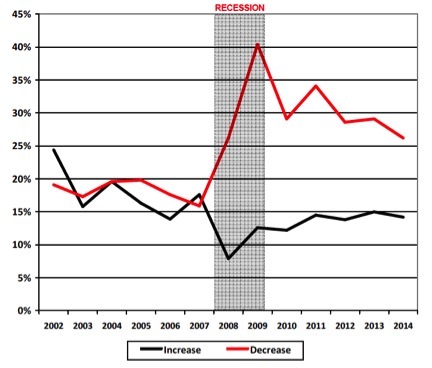 No wonder Altman Weil found discounting law firm rates rampant. Is it time for law firms to take a lesson from the airline industry – cut capacity?